Welcome to this week's guest, Kathryn Hodgson. She was born in England and spent her childhood exploring the rugged beauty of Cornwall. Kathryn pursued her love of nature as an adult and created a successful career within environmental enforcement in England and then as a scuba diving instructor in Egypt and Great White Shark wildlife guide in South Africa. She is co-founder of the marine conservation cause Friends for Sharks, inspirational indie writer & blogger, author of No Damage (December 2014) and lover of life, laughter and adventures. What brings your writing into focus-- the characters, the stories, the love of words? It is definitely the love of words that brings my writing (and my passion for writing) into focus. It is such a joy to be able to use different words and writing styles to describe tiny details that the eye sometimes misses but the mind holds dear. To think I can use words to create new worlds and to inspire others leaves me feeling very lucky and privileged. We all read books for many, varied reasons and I am fortunate that my love of words helps readers to laugh, cry and escape into new realities when they need it the most. How do you find time to write and do a demanding job? I am currently on a ten-month charitable world tour with my fiancé and our shark and marine conservation cause, Friends for Sharks. We are touring the world providing free educational conservation events for adults and children of all ages/backgrounds in eight different countries whilst also raising money for two charities. Finding the time to write whilst managing our events and everything that comes with it whilst living in a tiny campervan without mains electricity is a huge challenge for me right now! I try and squeeze in an hour or two of creative writing whenever I can find mains electricity and a table. I am also fortunate to have travel, scuba diving and creative blogs to maintain along the way. It is a busy and exciting time but, I admit, I long for the ability to get up at 6 a.m., sit at my own desk with a pot of tea and begin my day with a solid writing routine. What inspired your latest book? My memoir No Damage was inspired by a deep need to inspire and uplift others. After all that I had been through in recent years, I wanted to write my story down in the hope it would comfort others going through similar circumstances and remind them to never give up and to always be hopeful that tomorrow would bring them sunshine. I wanted make people laugh at the humour in the dark moments and to share my story to free myself from the emotional baggage I was carrying; it’s not often someone is left at the almost-altar twice, and I was very embarrassed by being that person! I also felt inspired to shed light on the uplifting and hilarious moments of going through those circumstances without casting judgement on anyone involved. It was important to me that I wrote a book that talked about taboo subjects such as abuse, cancer and grief with compassion and honesty in order to help others going through similar times feel less alone. I was also inspired to show the world you truly can survive anything life throws at you if you change your perspective, think positive and NEVER give up! Life is truly precious and I learnt the hard way how important it is to dig your heels in, fight for your dreams and smile all the way. What do you think readers will like about your book? I think readers will enjoy the honesty in my writing and that No Damage is written in a fictional style yet it is an entirely true story. I didn’t use any artistic license and I didn’t include embellishments, as I wanted my story to shine all by itself and be a record of what actually happened (sometimes I still can’t believe it all happened to me). I think readers will enjoy the humour in the highs, the heartfelt tone of the lows and the triumph in what is, by the end, a story of survival and joy. What tune/music could be the theme song for your book? The sound of laughter would be the music for No Damage and for my life in general. The curve balls life throws at each of us are unexpected, remarkable and often difficult to deal with. They can however be laugh-out-loud funny if we choose not to take them too seriously and instead go with the ride as best we can. Laughter has always helped me through and would definitely be the sound throughout No Damage. 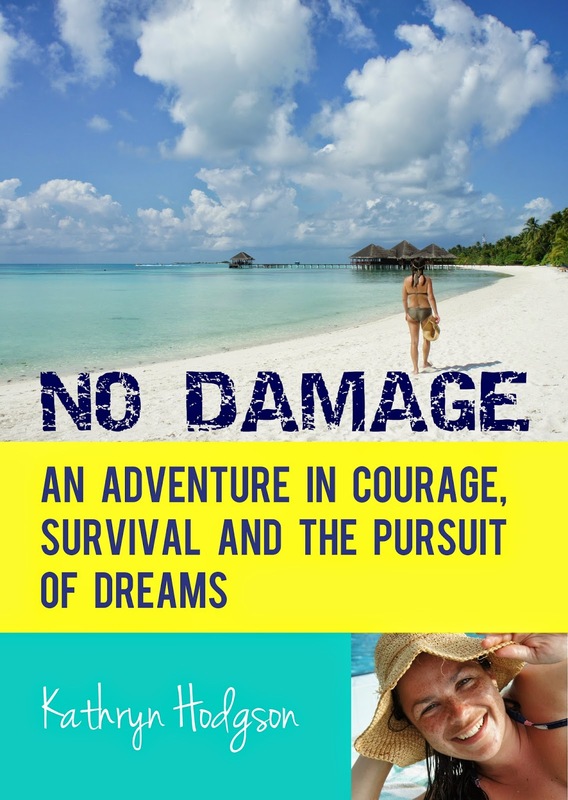 NO DAMAGE is an inspiring and uplifting look at one woman’s journey to survive two runaway grooms whilst coping with cancer, the loss of her career and more. Kathryn’s optimistic tale of hope, adventure travel and an unexpected stint in a South African prison explores how, as a single 30-something woman with just one suitcase and a head full of emotional baggage, she conquered her fears to pursue her passions. This memoir is both a hilarious true story of the power of positive thinking and a self-help guide to overcoming loss, following your heart and creating the life you want. Website: http://www.kathrynhodgsonauthor.com/ (Paperback £7.99 plus P&P direct from my website, which is cheaper than purchasing from Amazon. I also have an author blog on my website). Wow! What an incredible premise for a book! You have my attention! I'd also like to compliment you on your dress! It looks as if the picture may have been taken in the Napa Valley. Cheers to the author!